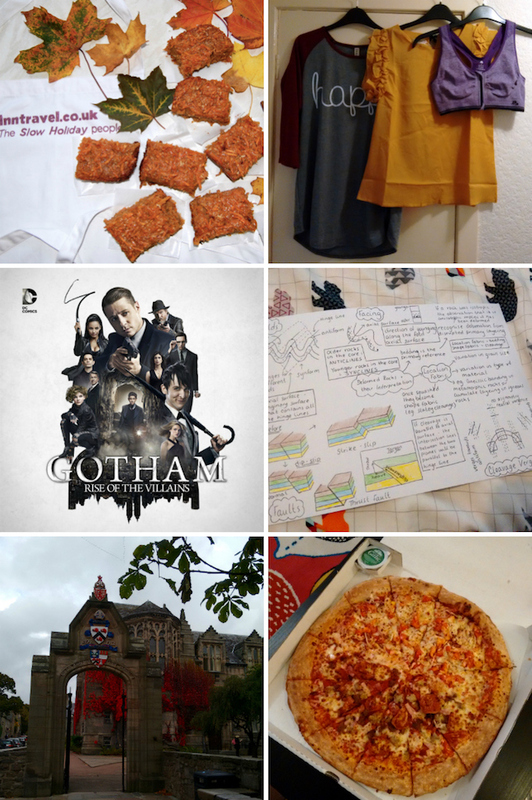 (From top left) This week I made a Sweet Potato Cake for a blog post - did you see it? New clothes in the post from TwinkleDeals* on Thursday. My flatmate and I finished watching the second season of Gotham this week. Started revision for a class test we have next week. The university is looking spectacular during autumn. A cheeky Papa John's to cure the hangover on Sunday. I got up early for yoga on Monday morning and felt good doing it but once I got back to the flat I suddenly felt really unwell again. I think I caught another cold before I fully recovered from my last one. I pretty much spent the rest of Monday on the sofa feeling sorry for myself then had a really early night. On Tuesday I felt better which was lucky because I had a 9am class. Afterwards I went to the gym, did a good workout then rushed home again because we were getting a smart meter fitted. I'm on a mission to save on our electric bill this winter so wish me luck! The rest of Tuesday was pretty chilled. After my morning class on Wednesday I got on with making the Sweet Potato Cake for a blog post for Inntravel. I like experimenting with new recipes and it was good to try something different too. The cake was yummy and with the leaves I found to take pictures with I was really pleased at the result. Scott arrived in the evening and after he helped me fix our front door we made spaghetti and meatballs for dinner and watched Hells Kitchen. It was another early night for me because I feel like I've been so exhausted recently. Thursday is a busy day at uni for me so I was so pleased when 4pm comes round and I can head home. I was able to publish a blog post before making dinner relaxing for the night. Friday is my day off but instead I got up early and worked all morning on revision before going to the gym in the afternoon. In the evening I helped my flatmate clear out her wardrobe and she made stir fry for tea. I was especially excited for Saturday because Scott and I were going to a party. I went swimming in the morning then did housework until Scott arrived. We made fajitas for tea before we headed to a pub to watch the first half of the football. We got a taxi to the party and it was SO nice to catch up with people I've not seen in ages and meet new people as well. Afterwards we went to a club which obviously meant a lot of alcohol and a very late night. My hangover on Sunday was pretty mild but any excuse to have a lazy day! Once we finally got showered at 3pm we walked to TK Maxx and B&M for a browse so we felt like we'd been out. We ordered pizza once we got back then were early in bed by 8pm. What a rock and roll life I lead!